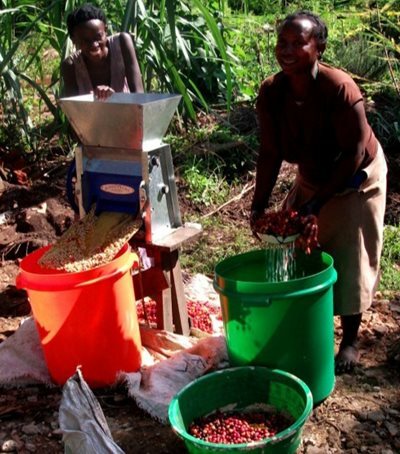 An Enterprise Group at St David's College created its own organic blend of Ugandan coffee from green beans , produced by a women's co-operative in Kyambura, south west Uganda. Volcanoes Safaris Partnership Trust run the coffee cooperative, OMWANI, consisting of 11 women. They grow and handpick only the highest quality coffee beans from their plantation. Just a few years ago these women were growing bananas and battling against banana-hungry elephants from the nearby National Park. It was suggested they try growing coffee - not a product elephants like to eat - and they never looked back. We love educating people in the UK about Ugandan coffee and how great it tastes!